With the release of book 3 ‘Reached‘ fast approaching on November 15th i believe, I decided that I owed it to myself to re-visit the series so that i was completely up to speed on what happened so that i don’t find myself re-reading things and scratching my head. trust me – that’s happened before when there’s been a lag between sequels coming out. The plot: we’re introduced to the leading lady – Cassia who is pretty much on par with many of the women that we find at the head of these dystopian tales. She’s perhaps not quite grown into her full potential, maybe even on the edge of being a bit off-putting, but it’s not really her fault. See, the society that Cassia lives in isn’t a great one. People are segmented in a way that makes some positions coveted and others completely abhorred. Lucky for Cassia, she’s not among the ones that are hated or looked down upon – she has an opportunity out there – assuming that she follows all the ‘rules’. These rules are what keep society and everyone in order and what allows for a somewhat peaceful (if you can call it that) existence, but what we know to be the case with all ‘teens’ – it’s never enough. When she ‘comes of age’ and is put to the ‘matching ceremony’ – a process that seems relatively fool proof, that’s when things start to go awry. What was deemed to be a ruling system that rarely if ever makes mistakes shows a crack in their armor and Cassia finds herself right in the middle of that. how do you figure that? well…enter the love triangle! These 2 guys, Ky and Xander are woven through her life in a way that’s not quite what she expected. See, the matching ceremony is supposed to match you with your perfect mate, and that’s typically someone from another town/settlement or whatever that’s quite far away. For Cassia, she was actually really lucky – when her match was revealed, it was none other than Xander – the boy that she has had a long standing relationship (be it whatever it was) and that couldn’t have been better. but then….a glitch happens and Ky’s face is then revealed – who is also someone that she knows. So what’s the likelihood of that happening right? not only was there a glitch, but she knew both boys. 1 is of an acceptable class and the other not so much. in any event, Cassia is then forced to choose to develop the correct relationship ad deemed by the Society and that’s one of the hardest things that she’ll ever have to do – to figure out exactly what’s right, if the Society is right, or if there’s something bigger and better out there. What i really liked about this lead in for the series is that the end just leaves you hanging. That’s how i judge if it’s a good story or not. do i have more questions to be answered or do i know what to expect? is it clear which relationships are strongest? do we know what the leading character is going to do and how those actions will ultimately affect their life? (relationships aside?) 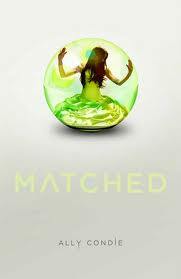 Matched did all that for me – i was left wanting more which was great since Crossed was just a few months away from release and that’s a story left for review for another day. 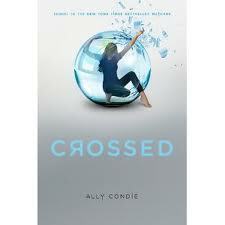 This entry was posted in Dystopian, Reviews, Young Adult and tagged Ally Condie, Crossed, Dystopian, Hunger Games, Matched, Reached, YA lit by iscm13. Bookmark the permalink. I love the book covers for one.. and the societal setting sounds pretty interesting.